Somewhat to my surprise, I have, in recent years, become a Christian. I am still not quite sure how this change happened, or what it means. I am certainly not an orthodox believer. But I have found my way into a strange kind of faith – partly willed, partly organic, by turns frustrating and sustaining. I had spent most of my adult life way beyond the reach of the church, as an atheist or as a Buddhist. But something about traditional Anglicanism had always drawn me, firstly when I was confirmed in my early twenties, and later, when my mother was dying, I found myself, one evening in early summer, walking through the door of my local church. After a lifetime of not quite fitting in, it was wonderful to find somewhere where I felt at home. Christians will take anyone, I suppose – that’s the point of it. But my new friends have shown me a kind of community that I did not know existed. I have been an analytical person all my life and am not about to stop now. But whatever errors I make, I know my more conservative friends will forgive me. With the delicacy of Australians, they will leave my search to me. We have had a number of ministers in my church, ranging from the evangelical to the liberal to the orthodox, and back again. The fact that one tradition can hold within itself such diversity seems to me one of the great glories of Anglicanism. But it can be exhausting, too. Like all communities, the church I go to is a political place. Whatever you may think about the Trinity, giving form to the spiritual in practical ways involves people interacting with each other and disagreements are inevitable. Old-fashioned Anglicanism has structures and processes to deal with at least some of the issues that arise. After all, that is the point of tradition. But conflict is inevitable in any human undertaking, not excluding one in which the over-riding instruction is that we are supposed to love one other. Those who might once have attended church because it was socially expected are now no longer there, which is probably a good thing. Those who practise an active faith do so because they are really committed to it. But theirs is a settled commitment. By and large my fellow-parishioners are conservative folk, not particularly interested in trying out new approaches. Why should they be? I could find another, more liberal, church, but I prefer orthodoxy. There seems to be more space in it, somehow. People give you odd looks when you say you go to Bible Study classes. Just about any other kind of class, from belly-dancing to whist, would be less problematic. I enjoy reading the Bible precisely because, courtesy of my non-believing parents, I was not indoctrinated in it when I was a kid. While, as most educated Australians do (or did), I knew the basics of the old and new testaments, there is so much that is new to me, so much to learn. I am like the fledgling birdwatcher who is pleased to identify a magpie when for more experienced observers, such everyday birds barely count. But their song enchants, just the same. We read ourselves into the Bible. The Bible reads itself into us. For those with a smattering of knowledge of the ancient and classical worlds, the Egyptians, the Greeks and the Romans show up, not as figures of history, but as characters in a drama, so close you can almost touch them. The Israelites, enslaved in Egypt, dealt directly with Pharaoh. Seen through Jewish eyes, the mighty king seems a somewhat paradoxical figure who, terrified by the events of the Passover, at first lets the Jewish people go, before changing his mind and deciding to pursue them. Jesus puzzled and provoked the Romans as much as he puzzled and provoked his fellow-Jews. The Greeks are there, too, lively, skeptical, constantly talking. Paul, who started the church in the Greek-speaking world, found them extremely difficult to convince. One sees here all the frustrations of a man trying to establish a new organization, needing support, dealing with difficult people, trying to keep his adherents’ feet on the ground while setting out the bearings of a new way of living. When I first started going to church, I was very unsure about the nomenclature of belief that seemed to require one’s assent. Then it just seemed natural to give the responses. The language of metaphor becomes, over time, the language of faith, and faith is quite different from belief. Belief implies certainty, whereas faith contains both commitment and uncertainty. But if you pay close attention, you find something else. Even faith must be transcended by love. For without love, we are nothing. We know this, but how to translate this insight into a practicality of living, defeats all but the most saintly of us. Contemporary theological writings offer a plethora of differing perspectives. At their most useful, these scholars give us a reasoned and reasonable confidence to think for ourselves. The forms of worship we adopt are, as prolific British theologian Keith Ward has argued, in every case the legacy of many centuries of change, disputation and development. It is obvious, though, that organised forms of religion, as represented by the churches, are eroding away. 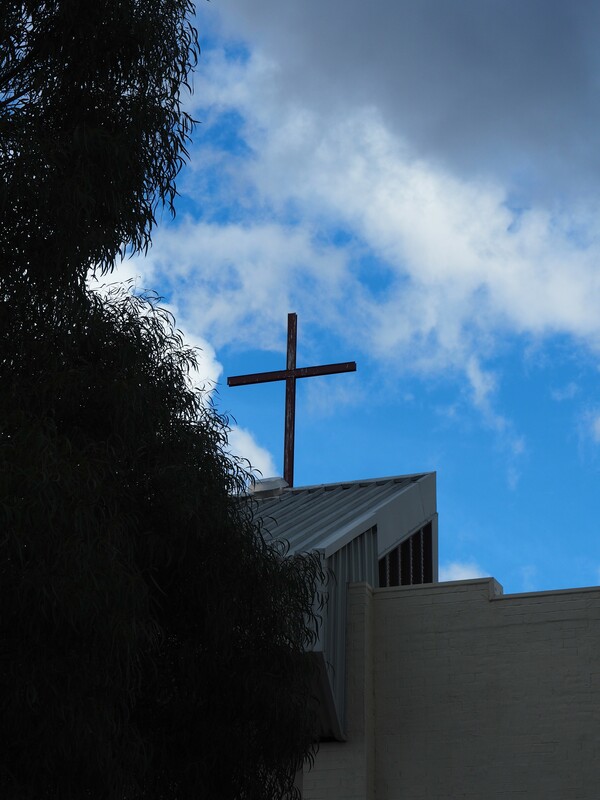 While most Australians (just over 60% according to the most recent census) classify themselves as Christian, Christians represent a declining proportion of the total population (a century ago, the figure was 95%). Of this group, the proportion going to church regularly is also falling. It is the traditional churches that seem to be suffering the most. Total attendances at both Catholic and Anglican churches are in decline. In rural areas, the fall in numbers has been greater than in the cities. Without a growing population base to support them, churches in the country are particularly at risk. From within, many churches are full of life, of people caring for, and about each other. But in overall terms, the institution they represent is shrinking. There will always be those who are drawn to ministry. And while they are still about, middle-aged and older women will continue to be the mainstay of many congregations. There are many reasons for this. Census data tells us that women, in general, are slightly more likely to be religious than are men. By and large, women still do the emotional work of families, and many continue this role in a religious context. Some are finding refuge from non-religious or difficult husbands. In any society, older women are also the most negatively-constructed group. The Christian religion gives us work to do and a measure of autonomy. Increasingly, the religious professional carrying the service is a woman. Yet it is the schools they run, and the not-for-profits they own, rather than the churches themselves, that constitute the bulk of their social activity. Given the predatory behavior of at least some of the male clergy in the past, the fact that lay teachers and other professionals do most of the extra-religious work is to be welcomed. But there is a paradox at work here. The more successful their schools become, the fewer Christians they seem to be turning out. The result is that the organized churches, considered as religious entities, are nowhere near as prominent, in the lives of most people, as they used to be. Former Anglican bishop Tom Frame, in his book Losing my religion: unbelief in Australia, fears that the meta-narrative, the over-arching story, of Australian Christianity will soon be lost. The churches, he believes, will concentrate on large catchment areas. They will become more introverted, less socially oriented, less liberal. Evangelism beats the quiet assurance of the prayer book, the rotund tones of the organ. Certainty trumps doubt. This may well be the path of the future. But if they simply become more conservative, the churches will have missed a significant opportunity for growth. We know that many people have a belief in God. We know that the reason they do not attend church is that they find religion to be irrelevant to their lives. For most Australians, the morality that they practise comes from family, or peers, or cultural tradition. So what should the churches do? Should they just forget about the marketing, and be themselves? Should they become more, or less hardline? Should their congregations stand on street corners, and spread the good word in person? The problem is that most Australians run a mile from this sort of ‘good news’ proselytising. We do not want to be ‘converted’. Nevertheless, I think there is an opportunity in this country for the exercise of a truly significant spirituality, not because Australians are somehow unspiritual and in need of special attention, but because there is already a firm tradition to drawn from. If there is one country where, freed from the constant blows of conflict and the pressures of poverty, it is possible to focus on the important things of life, it is here. It is important not to over-state the ‘lucky country’ thesis. Whether from an Aboriginal or a non-Aboriginal perspective, life in this country was not always easy, and of course at the individual level, no life is easy. Don’t be fooled by the thongs and barbeque image. Despite the increasing materialism, I think most Australians are natural Christians, even if they never go to church. When we had nothing, we looked out for each other. Now that we are richer, on the average, I hope that we are still looking out for each other. We have never been subjected to the apparatus of power and of class that crippled so many European societies. Many of our forebears were rejects and outcasts. Blessed with a wide brown land which resists cultivation, we do not have an over-large population. We break the hearts of our intellectuals, but never their bodies, or their minds. We are the supreme pragmatists. If it does not seem relevant, we ignore it. In what sense, then, might Christianity come closer to us? I do not think it is the form of worship that needs to change. There is, in any case, a veritable smorgasbord of forms from which to choose. But the churches should be more ready than they are to acknowledge that they do not have all the answers, and only some of the questions. They should acknowledge that belief and non-belief both need each other. They should acknowledge the importance of doubt, not as a dire problem that must be overcome, but as a simple reality. Make it clear that there is an atheist in every Christian, and vice versa. Christianity has always evolved. That is its great strength. You do not have to check in your mind at the church door. There is a dialogue to be entered into. Christians talk a lot about the power of prayer – and it is powerful. Not because prayers are necessarily granted, but because of what they represent. Praying for another, out loud, both helps us, and forces us to understand their situation. How difficult it is to do well! To find the right words from a full, and an open heart, is a true exercise in compassion. But it is possible, too, for Christians to learn from other traditions. As a Buddhist, I learned not to over-theorise myself. I learned that my ever-present personal identity was not as important as I had thought. I learned that thoughts are not realities. I learned the importance of equilibrium. I learned practical methods for generating compassion. I learned that the only way to beat the dark stuff is with love. Jesus said exactly this, of course. The right prayer is always answered. There is too much still to absorb from the teachings of Jesus – and our thinking about them – to let these possibilities die. There are many ways to belong, just as there are many ways to believe. The Christian conversation has not stopped. It may just be renewing itself. Dr Jenny Stewart is a Canberra-based writer and former academic. An edited version of this essay was published in Quadrant, May 2015.